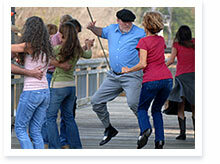 Baton Rouge, La – On Feb. 9, 2012 Blue Cross Launched Mobile App to Help Louisianans Eat Right and Move More. The iPhone app provides an easy way to track healthier lifestyle choice. This free and fun motivational program is designed in collaboration with Pennington Biomedical Research Center to inspire healthier choices. The 2 Step program offers tools and resources to help people take two simple steps to better health: eat right and move more. Launched in 2007, the award-winning Louisiana 2 Step program is a fun, free and motivational way to teach adults in Louisiana two simple steps to better health: eat right and move more. Through the interactive website, www.Louisiana2Step.com, participants can use tools and get information to help get healthy and stay healthy. Kids ages 5 to 12 can find their own age-appropriate tools, games and info at the 2 Step 4 Kids companion site (www.2Step4Kids.com). The 2 Step is the ultimate tool for "health guidance." Louisiana2Step.com provides: information on eating right and moving more; health tracking tools; goal setting tools; guidance for healthy families; healthy recipes; links to support organizations. The SU Ag Center will hold its 69th Annual Livestock Show March 1-3 at the M.A. Edmond Arena in Baker, located on Scenic Hwy. Youth from across Louisiana are getting ready to display their animals in a competitive, yet family oriented environment at the Annual State Livestock Show organized by the Southern University Agricultural Research and Extension Center. 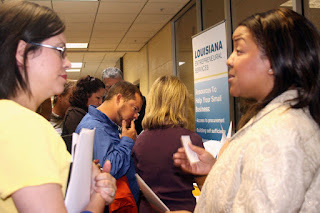 BATON ROUGE—Southern University Agricultural Research and Extension Center will hold its 8th Annual “Connecting Businesses with Contracts” Procurement Conference, April 10, 7:30 a.m.-3 p.m., in the Smith-Brown Memorial Student Union, 500 Jesse N. Stone Ave., on Southern University Baton Rouge campus. The event is open to all small business owners, contractors, and the public, but registration is required. The conference will bring together potential and existing contractors, entrepreneurs and government agencies with contracting officers and purchasing agents. Attendees will receive information on sources of assistance, the process of registration and obtaining licensing, methods of financing, and securing contracts. Participants will also learn the latest techniques on selling products and services to private industry, federal, state, and local government agencies. Representatives from the United States Small Business Administration will be available to discuss SBA programs, guarantees, the certification process, bonds and surety, GO Loans, and disaster loans. The Louisiana State Contractor Licensing Department will also be available to answer questions from individuals who want to become licensed or existing contractors. 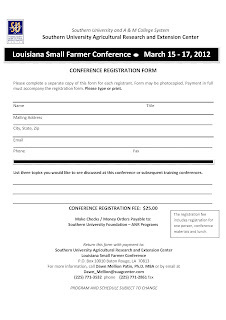 The Center for Rural and Small Business Development at Southern University Agricultural Research and Extension Center, Southern University College of Business, the U.S. Small Business Administration, Louisiana Small Business Development Centers of Baton Rouge and Lafayette, and Louisiana Procurement Technical Assistance Center will host the conference this year. Pre-registration is required. To obtain more information or to register, contact Gloria London, Director of the Center for Rural and Small Business Development, or Eual Hall, Business Development Specialist, at 225.771.4107 or 225.771.4105. Baton Rouge, LA – Southern University Agricultural Research and Extension Center hosted the 18th Annual Black History Quiz Bowl, February 23 at A. O. Williams Hall. This year, the Timbuktu Academy team took first place in the nine-team competition. Last year, Capitol High School took home the prize. SU Ag Center and the College of Agricultural, Family and Consumer Sciences jointly organize the event involving stiff competition among high school and college students under the leadership of Dr. Owusu Bandele, professor emeritus, horticulture. “It was a great competition; it is all in the preparation,” said an elated Bandele at the end of several rounds of contests. When asked why it was important to hold such competition, Paula Mensah of the Timbuktu Academy responded that preparing for events like this gives the younger generation an opportunity to learn and remember great African Americans who paved the way for them. Baton Rouge, LA – Southern University Founders’ Day Celebration themed “Strengthening the Gift of a Strong Foundation," will take place March 4-9. The Ag Center will sponsor an Exhibit and Tour as part of this celebration on March 6, from 10:00 am-2:00 pm in A. O. Williams Hall..
During this week, we pause to celebrate 132 years of Southern University and the heroic efforts of many; and to reflect, analyze and strategically forge our path to the future. Baton Rouge, LA – Southern University Agricultural Research and Extension Center hosted the 18th Annual Black History Quiz Bowl. This year, the Timbuktu Academy team took first place in the nine-team competition. Last year, Capitol High School won first place. 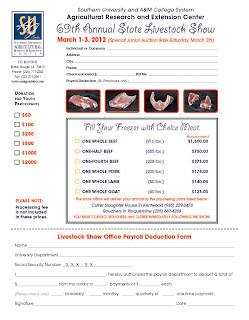 Baton Rouge, LA- the SU Ag Center will hold its 69th Annual Livestock Show. Youth from across Louisiana are getting ready to display their animals in a competitive, yet family oriented environment at the Annual State Livestock Show organized by the Southern University Agricultural Research and Extension Center, March 1-3. The Show will be held at the M.A. Edmond Arena in Baker, located on Scenic Hwy. The Show features prize-winning animals that have won in parish and district competitions. Judges will name the state champions in different breeds including lamb, swine, goats, beef and dairy cattle. This year, the event will feature an old fashion livestock decorating contest called “Night with the Stars,” on Friday March 2 at 7 pm. Tour groups will discuss various animals, their food sources, farming and how agriculture plays a part in everyone’s life. The Southern University Ag Center Livestock Show remains the premiere event for displaying youth showmanship and quality animals. The Show and related programs teach leadership, character development, and entrepreneurship skills to the youth who prepare year round for competitions. An awards presentation will take place on Saturday, March 3 at 8:30 am, followed by the Junior Auction Animal line-up at 10:30 am and concludes with the Sale of Champions. 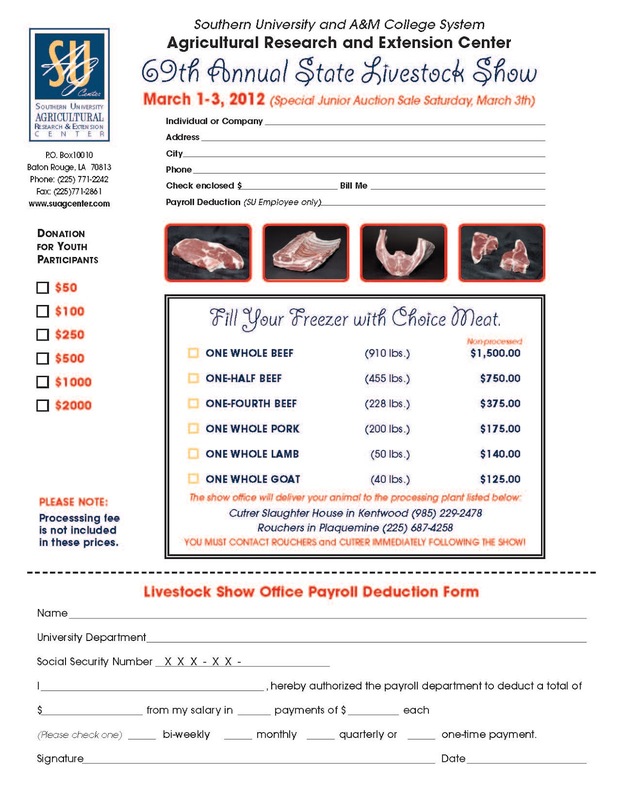 You can pre-order your meat by completing the attached order form and returning it before the show. You can also make a donation to support our youth in lieu of meat purchase. Baton Rouge, LA – Dr. Adell Brown, Executive Vice Chancellor & Vice Chancellor for Research, Southern University Agricultural Research and Extension Center will co-host a forum with NBC33 TV News Anchor, Tammi Arender. Rev. Alvin Herring, Executive Director with Working Interfaith Network, announced a Town Forum coming up on Feb. 24 at the Baton Rouge Marriott, which will address issues pertaining to crime. The public is invited to attend the Forum, which will air on NBC33, Feb 24, 2012 from 6:00-7:00 p.m.
Baton Rouge, LA— Farmers and Ranchers now have a more efficient and timely option for receiving important Farm Service Agency (FSA) program eligibility requirements, deadlines and related information. USDA/FSA is now offering free online communications through GovDelivery electronic news service. Acting Under Secretary for Farm and Foreign Agricultural Services Michael Scuse announced on Feb. 10, a package of technology enhancements from the Farm Service Agency that includes Web access for handheld and smartphone users, as well as a more efficient and timely option for receiving news and critical program information. The technology improvements will allow users of FSA information to gain access to easy-to-read data, including key features such as loan deficiency payment (LDP) rates, posted county prices (PCP), FSA news releases and AskFSA, the agency’s online self-help knowledge base. Like all websites, the FSA site is accessible through any device that connects to the Internet. The mobile site organizes the information on the website in a way that makes for easy reading on a small, hand-held screen. It does not require screen adjustments or constant scrolling and panning across the information. In addition to the mobile website, FSA is now offering farmers and ranchers a more efficient and timely option for receiving critical program information. Such things as eligibility requirements, deadlines and related information can be accessed through an electronic news service hosted by GovDelivery. By signing up for free online communications through GovDelivery, farmers and ranchers can receive news, via e-mail, directly to their home or farm office or to their mobile devices—allowing them to receive immediate notification of farm program news that is pertinent to their agricultural operation. To access FSA’s mobile website visit www.fsa.usda.gov/mobile. To sign up for FSA’s GovDelivery electronic news service, visit www.fsa.usda.gov/subscribe. For information on USDA’s Blueprint for Stronger Service, please visit www.usda.gov/strongerservice. Visit http://content.govdelivery.com/bulletins/gd/USFSA-2e6c51 for full story. 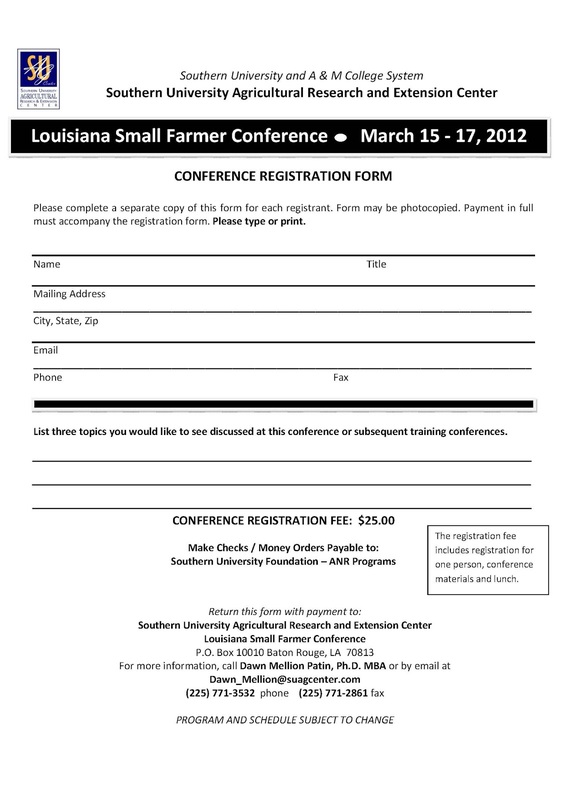 Baton Rouge, LA – The SU Ag Center will hold its second Annual Louisiana Small Farmer Conference at A. O. Williams Hall, Southern University Ag Center, Baton Rouge, from March 15-17. The theme for this year’s conference is “Building Capacity of Louisiana’s Small Family Farms.” The general session will focus on ways to building capacity of Louisiana’s small family farms and several concurrent sessions, will be held. The conference will begin with a preconference session of farm tours in Pointe Coupee and West Baton Rouge Parishes. Other topics will be covered such as food safety, record keeping, succession planning, mentoring the next generation of producers, cooperative development, diversification, USDA programs and services, and accessing new and emerging markets. The conference is open to new and beginning farmers, small farmers, agricultural business owners, community leaders, non-profit organizations, and community-based organizations. The conference registration fee is $25 and exhibitor registration fee is $200.00. The registration forms are attached herewith. 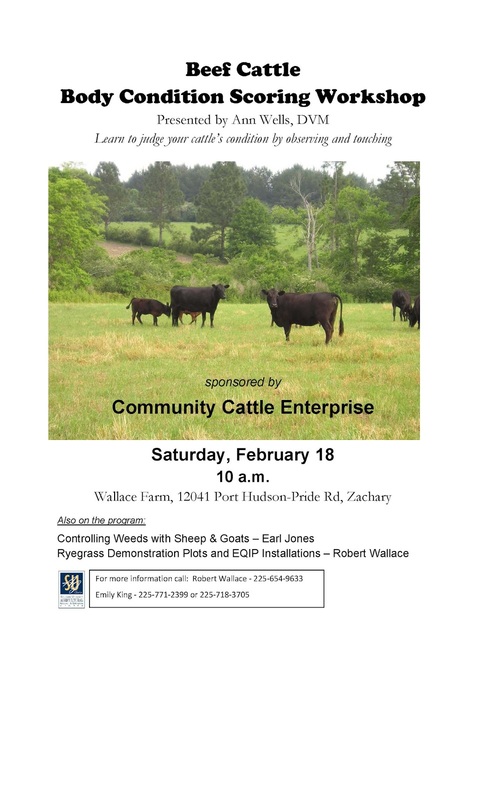 Baton Rouge, LA – Community Cattle Enterprise will sponsor a beef cattle body condition scoring workshop on Saturday, February 18, at 10: 00 am on Wallace Farm, 12041 Port Hudson, Pride Road in Zachary. The workshop presented by Ann Wells, DVM, will teach you how to judge your cattle’s condition by observing and touching. 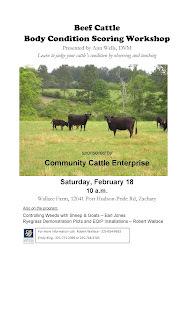 Other topics on the program include Controlling Weeds With Sheep and Goats, presented by Earl Jones; and Ryegrass Demonstration Plots and Environmental Quality Incentives Program (EQUIP) installations, by Robert Wallace. Community Cattle Enterprise was established in 1988 to help limited-resource livestock farmers in East Baton Rouge Parish and surrounding areas become more efficient and sustainable producers and to train small livestock producers. The Enterprise helps train future livestock producers and helps local 4-H exhibitors prepare for livestock shows at Southern University and LSU. For more information, please contact Emily King, outreach specialist, SU Ag Center at 225-771-2399 or 225-718-3705; or Robert Wallace at 225-654-9633.